Whenever I sit down to start writing about everything that’s happened in the last few months, I get overwhelmed. I don’t know where to begin. 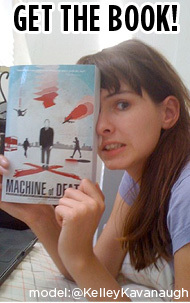 The sequel to Machine of Death will be released in July 2013, premiering at Comic-Con in San Diego. It will be published by Grand Central Publishing. The cover was designed, once again, by Justin Van Genderen. The book will feature illustrations from a ton of artists including (besides those already mentioned): Nick Abadzis, Graham Annable, Sam Bosma, Trudy Cooper, Mike Dawson, Aaron Diaz, Alexandra Douglass, Meredith Gran, Dustin Harbin, Tyson Hesse, Braden Lamb, Les McClaine, Carla Speed McNeil, Carly Monardo, Danica Nogorodoff, Emily Partridge, Mike Peterson aka Halcyon Snow, Ramón Pérez, Greg Ruth, Chris Schweizer, and Dana Wulfekotte. 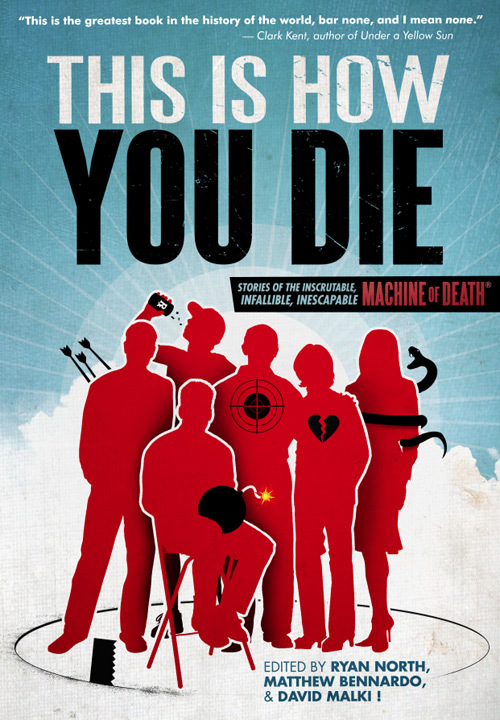 You’ll notice that up above, I called this book “the sequel to Machine of Death.” I didn’t say “the second book in the Machine of Death series.” Lots of people are assuming that we’ll just go forward and do a third book, a fourth book, etc etc. We’d love to! But we are taking this one measured step at a time. There will only ever be a third book if this second one does well. And so, while we’d love for the book to be out now, Grand Central Publishing has asked for the necessary time to run the book through all the standard book press channels and publicity & marketing opportunities. We want to give this book — and the work of all these amazing authors and illustrators — the absolute biggest rocket-boost possible so we can send this whole project into the friggin stratosphere. And you can help too! 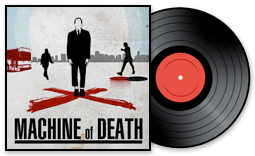 Our goal, between now and July, is to get as many people as possible excited about the Machine of Death idea, and reading the first book — so the second one will explode like crazy. 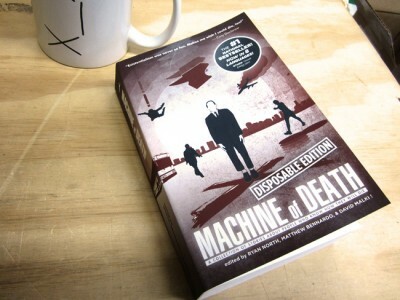 This is our new “Disposable Edition” of the first book. Quite simply, it’s the cheapest possible version of MOD in print. We tried to make the barrier to entry for this thing as low as possible. On the fence about buying it? Got a friend that you need to get a gift for? Want to spike your coffee shop’s free-books pile? Want to keep a copy on-hand to give away to someone about to take a long train ride? The MOD Disposable Edition is the answer. 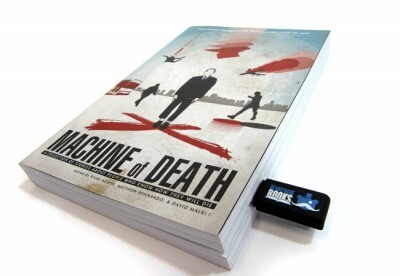 We’ve also put our ebooks — all flavors, all DRM-free — on a thumb drive. Again, handy for gift-giving, or maybe you just want a Bearstache Books thumb drive? You can also grab a print edition (regular or disposable) with the thumb drive at a deeper discount. Oh, and we threw on the thumb drive for free our entire podcast series — all the stories, read by either their authors or our charismatic friends. And some performances from our Talent Show & Magic Show. So you’re basically getting an audiobook for free as well! 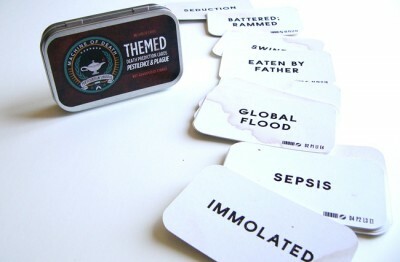 We’ve added two new varieties to the Death Prediction Card Sets — “Set C” and “Pestilence & Plague” — and hidden fan-created custom cards in random tins (of all 6 sets). If you find a custom card, you win a prize! And in addition to the games we’ve already created for the cards, I’ve been working with some secret friends on a bigger, more elaborate tabletop-style MOD card game. It’s still in development, but all the existing card sets will be backwards-compatible with it…so in essence you’re buying expansion packs before the game even exists yet. Look at you! So smart, so savvy!! 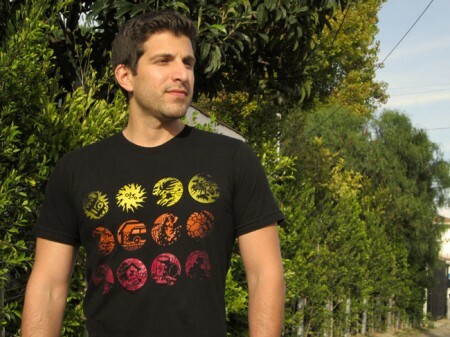 Finally: this shirt is on clearance right now at TopatoCo for $12, and then after Sunday it disappears forever. UPDATE: It’s gone! Our first book is still available as a 100% free PDF. Share it, send it to your friends, print it out and wallpaper a hallway with it. So many people have come up to us at cons and thanked us for making it freely available, many of whom would never have discovered it any other way. It’s still there and it’s still yours to share. Thank you so much for making all this possible!